The world of the monk is a harsh one. It is said that the monk is steeped in tradition, but the truth is that these traditions span a diversity and depth comparable to the great schools of magic. From the disciplined exercises of a novice, the brutal application of the ascetic warrior, to the flawless execution of grandmaster: a vast range of possibilities exist. In the Monk Unfettered these traditions and possibilities are explored. I'm not sure Monk Unfettered will satisfy many people's complaints about the core monk, though it certainly will satisfy some. Even though some things, like flurry, are simpler, I suspect it will still take some system mastery to make a fully effective unfettered monk. That said, that's not necessarily a bad thing. It just means the class won't be for everyone. One thing Monk Unfettered definitely does succeed at, though, is expanding the versatility of the monk class. Monks created through this book have a much wider degree of choice available to them, meaning players can create more different kinds of monks than ever before. I suspect that any group that chooses to use this book will gain a lot from it. The Monk. With added Monk. The Monk Unfettered offers a pre-Pathfinder Unchained revision of the Monk class, intended to overcome the monk's Core Rulebook shortcomings (such as low hit rate, MAD, and the movement/full attack conundrum, to name a few). Careful design. The author take a lot of time explaining exactly why he made the design choices that he did, in a section at the end of the book: you can tell that he's put a lot of thought and number-crunching into this class, and worked hard to make this monk at least as interesting as the Core monk at all times, and also offer greater flexibility. Insights. This is probably the biggest single departure from the Core monk. Insights are gained at 1st and 2nd level, and at every even level after that. They range from a number of Core monk abilites (which got pulled out of the main class features), to completely new abilites, with a broad range of applicability (that insight you pick up at 10th level is almost always going to be as powerful as any other 10th level insight, regardless of which one it is). Stunning(ish) Fist. This was something that made me sit up and take notice. One of the main things I've always liked about the various iterations of the monk is stunning fist. It's just a shame that it's less useful than I'd like, most of the time. The Unfettered Monk takes Stunning Fist and shifts it into overdrive, in the coolest possible way. Yes, it suffers from the old "must choose before the attack" problem, but being able to actually paralyse the target for 1d6+1 rounds at 20th level? That's awesome. There's not really a lot of bad to mention in this book. Having seen the Unchained monk, this one does suffer slightly from design inertia, as plenty of the Core monk abilities have been left in as automatic, but it feels much more versatile thanks to the Insights. If this had been the Core monk, I think we'd have far fewer complaints about the monk. It's a good, solid take on the theme, and the added extras in the book (advice on existing archetypes; the design choices secion; favored class option from here to infinity and back; and a slew of new magic items) make it a worthwhile read. I don't think anyone who chooses to use the Unfettered Monk instead of the Core monk will be disappointed. Full 5-stars because I'm using this book, and the class is awesome enough to make me want to point people at it and say "here, look at this!" Monk Unfettered is quite possibly the single most in-depth re-write of the monk class ever done. From the first page, it is obvious that this supplement is a labor of love. The description calls this a complete reinvention of the monk class, which isn't much of an exaggeration. While the basic format of this monk is similar to the original, several changes have been made. The first thing that jumps out is the change to the monk's flurry of blows. For making 1 fewer attacks that the vanilla flurry, this monk makes each flurry at their full base attack bonus (meaning where a core monk would have a flurry of +6/+6/+1/+1 at level 8, the unfettered monk has a flurry attack of +6/+6/+6). The author discusses this in the introduction, and while my initial knee-jerk reaction was to think that this change was way too powerful, the author asserts that the approximate DPR remains unchanged. The second major change is the addition of ki abilities called insights, which are similar to the ki abilities of the more recent Unchained monk, but far more in-depth. The sheer number of insights allows for the creation of multiple unique monks, from a Fist of Legend style beat-stick, to a ki channeling mystic, to the wise teacher in the tradition of Kwai Chang Caine. All said, there are over 140 insights, and while several are based on or improve upon existing monk abilities, the vast majority are new and flavorful additions to the class. The final change of note to me is the full page of favored class options. Breaking from the standard put forth by Paizo, the unfettered monk has numerous favored class options which depend not on race, but on minimum ability scores and insights. All in all, this supplement makes me somewhat disappointed that my normal group doesn't allow 3rd party supplements. While there are some minor improvements that could be made to this supplement (see Oliver Volland's review for a very comprehensive list), as a whole this is one of the finest supplements that I have come across for Pathfinder. This is a review for 'Monk Unfettered', a supplement by Henri Hakl Games. I'm not a native speaker (I'm German), so I may have fumbled my language skill checks from time to time. Give me a note if I wrote something wrong and I'll try to make myself more clear. 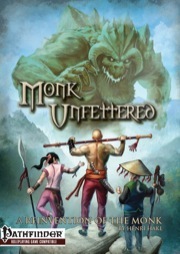 Monk Unfettered has 35 pages and many nice pics (and a cover, OGL and so). The basic idea of this supplement is to give the monk options, and it succeeds at this by introducing insights which function a bit like rogue talents or rage powers in so far as there are deep and basic insights, The difference is you can take the deep insights early on, but are limited in using them. All in all 6 bonus feats and 8 special abilities are taken away, and 11 insights are added to each character, which is a nice balance since you can tailor the insights to fit your concept. Good work! Oh, and did I mention there are 152 chooseable insights available? Yes, 152, and almost all are at least good, some great. You can construct any character build you want with a well of possibilities like this. Of those 152, 6 are the special abilities monks lost due to the addition of insights, so if you want you can rebuild most of the standard monk with this new systems also, though you'll have to replace the bonus feats with complimentary insights, which should be possible in most cases. The other main change is about flurry of blows, generally speaking you get less attacks with them but are more likely to hit, since all are equal in strength and tied to your BAB. While mathematically the hits you are likely to achieve with both methods are about equal, the misses are reduced with this method. Mathematics to prove this claim are included, and while I'm no mathemagician (pun intended) to verify it, at least it reduces the attack time at the table if someone can roll many dices at once instead of one after another with different change modifiers on each. Also, who doesn't like to roll many dices at once, like in a fireball? Like the changes in flurry of blows some other changes are explained on three pages as well, for example the high movement but full attack for flurries, and are adressed with the insights. There are even suggested combination to take full advantages of some ideas and a reference table for the insights. Last but not least there are some full basic builds for inspiration or to use as NPCs, fully fleshed out with a picture, Before Combat, During Combat and Morale lines, suggested encounters and so on. All in all we get 7 monks ranging from CR ½ to CR 18, every one of them about a page long. On top of that, we get new toys like feats, lots of favored class boni (surprisingly none of them race.tied), new magic items and thoughts about using the existing archtypes with the new changes. Now, normally you would read in my reviews about things I liked and those I don't, but in this supplement almost everything is good or even very good, so I just go to the part of minor complains and questions which are mostly easily fixed. - the Ex-Monk section is contrary to the Beyond Order feat that is introduced later on which does allow non-lawful monks. I'd rule that the feat superceeds, but its not mentioned, and it would be interesting to know what would happen if the character took the feat later on. Will he be a full monk again? - sometimes the 'Meditation Insight' is named as a requirement, but there are insights like Meditation of the Beast. Do they qualify? - are reach melee attacks included in the damage of Elemental Awakening Fire? - Why is Elemental Mastery Water limited to enemies, but Fire isn't? - Why does Faster Movement end with level 17? Wouldn't be +10 feet an acceptable choice? - Does Monkey foot count against the movement of the current round or the next round like the feat Step Up does? - The table on page 3 is a bit lower on the page than it should be. Asura Curse and Accurate Self should both be deep insights (they have the asterisk). All in all you see I'm nitpicking here – it tells about how little is wrong if I mention such things as I do above. My two a bit bigger complaint are about the Improved Wholeness of Body Insight, it turns the monk too much into a healer in my eyes, and the synergy of the various Cat-Insights with the feats Piranha Strike and Slashing Grace. I think here a failsave should be added to limit powerbuilding. Finally I'd tie the Favored Class Options to races, tagging on the better ones to classes with limited powers and vice versa can level the field a bit. All in all, the author claims this work being a labor of love, and it sure is. There is a lot of thoughts and experiences and, yes, love in these pages. I can wholly recommend buying it. I never played a monk myself, nor was I ever interested in playing one, but this supplement makes me want to try one. For this, its 5 of 5 stars and the the first time I'll give out the crown of approvement. Great work! Now available (and welcome Henri Hakl Games)! Before I shell out the 6$, how many pages is this book? From your description is this more martial artist then current monk? How is it "invented"? I'm Henri Hakl, the primary author and designer. Though I drew upon various sources (the only name you might recognize is Jerall Toi). The monk is reinvented mechanically, specifically the flurry mechanic is completely reworked and the vast majority of class abilities are rolled into insights (similar to rage powers and rogue talents). Whether you design your character to be more mystical monk or more pure martial artist is up to you: there is a large set of insights that cover a wide range of martial concepts and monk tropes. I don't have a hard number for you but there are well over 100 insights. I hope that helps, if you have more specific questions don't be afraid to ask. Welcome to the store, Henri! I merely played the role of sounding board (or would wing chun training dummy make for a more suitable metaphor?) for Henri's design work. On a related note, I think this may be one of the first (if not first) wholly South African (barring one artist) third party products. I'd love to be proven wrong on that though. And for everybody interested: Jerall Toi's blog has a sneak peak of some of the content, including some art samples. Well worth the visit. I bought this on a whim along the Pathfinder Unchained. I also have the Talented Monk and the follow-up. I must say that while I really dont like some of the design desicions, the Unfettered Monk lets me create MOST monk characters I would like to create, unlike the core unchained and talented. I will do a review after I try a couple of builds. the vast majority of class abilities are rolled into insights (similar to rage powers and rogue talents). That's much the direction I took with the "Kirthfinder" monk as well. Great minds! I'm looking forward to the review. If you don't mind me asking, what design decisions did and did not sit well with you? Regarding monk diversity: yes, it was a design goal to be both extremely flexible as well as cover as many possibilities that I could think of. If you have some great ideas that aren't covered yet I might design them into the PDF and release them as an update - so don't hesitate to let me know and discuss. I've just had a good look at the Kirthfinder monk, there are some other parallels where we have different design details but similar overall intentions. For example, the Kirthfinder monk's flurry is a full-BAB but the iterative attacks never have a penalty of greater than -5. In contrast, the Unfettered Monk retained 3/4-BAB even when flurrying, but none of the attacks take a penalty and they have a faster progression. The unfettered monk doesn't use ki spells like the Kirthfinder monk (though some insights duplicate spell powers), however the list of insights is truly massive well in excess of 100 insights and some of them expose rather exotic powers. Overwhelming spirit (Ex)*: shaken enemies within 10 ft of a monk with this insight remain shaken even if the duration of the shaken condition has expired. At 8th level and every 4 levels thereafter the range increases by 5 ft up to a maximum of 30 ft at 20th level. Edit: I noticed another overlap between Kirthfinder and Unfettered: Kirthfinder provides some class-specific favored class bonuses for the monk. The Unfettered Monk does something similar, but has a whole section dedicated to it, exposing just shy of 30 alternate favored class bonuses. Hoorah! The Monk Unfettered has its first review (thank you TriangularRoom). After reading it I thought I should share what is meant by deep insights that are mentioned in the review. Deep insights are particularly powerful insights. Unlike, say, advanced rogue talents, deep insights can be taken from level 1 - however there is a limit to how many of them the monk may have active at a time. At level 1 only one deep insight can be used - but increasing levels and certain other options (feats, insights, etc) allow the monk to use more deep insights simultaneously. Basically, alignment and costs of some abilities and some redundancy which I will expand in my review. Ah yes, I am personally of the opinion that the (normal) monk should be lawful. To me the class instill a sense of discipline and gravity that is best reflected by the lawful alignment. That said, I agree there is a space for non-lawful monks (and that is why I included the Beyond Order feat). yeah but... four feats? If I wanted to play a non-lawful monk, I would play a brawler or other unarmed character instead of paying for four feats. I would allow neutral monk for a trait and a chaotic for that trait and a feat. But 4 feats is almost half of your feats! Sure, it is easier to just dip into it, along with a feat. I think it is balanced out a little by the class itself being quite generous with insights (11 in total) and as a rule the insights are better than a feat. True, the cost of 4 feats is steep. However, to me that is a fair price for being a non-lawful monk. Naturally the game is about having fun with your friends, so your table can houserule it to be more lenient. I propose this alternative: a neutral monk's "monk level" follows the 3/4 progression and a chaotic monk's "monk level" follows the 1/2 progression. This only has an effect for insights that specifically call out the monk level. For example, a 12th level monk with wholeness of body would heal 12 hp if lawful, 9 hp if neutral, and 6 hp if chaotic. Interesting. I'd really like to hear how the Talented Monk falls short for your needs, since it's one of my favorite third party products. I'll keep an eye out for your review and consider getting this when I have the cash. Can't have too many ways to make a monk! That sounds better and works with the feats in the book. I agree that a monk inspired by buddhist/shaolin monks would be lawful, but then again we have taoist monk who are better represented by a chaotic alignment. I finished my review. I didn¿t include the redundancy examples since I just found one. Dex to damage during flurry costs two insights, and you can get Dex to damage for AoO for another insight. But if you use Embrace the Cycle, you can always Dex to damage from level 8 on. Thank you the xiao, that's a great review you have for the Unfettered Monk. I really like that you pointed out Ki Craft positively. I was a little worried how it would be received as it opens up strange possibilities. To help out the feat and monks who take it: note that all the magic items in Unfettered Monk only require Craft Wondrous Item and that the creator is a monk - meaning Ki Craft can be used for those items without extra effort (getting the crafting spell cast somehow). You also mentioned the feat Style Shift, to alleviate the feat-intensive nature of Style Shift note that it combos really well with Improved Formless Stance. The problem I have with the talebted monk is that it is really easy to create an unplayable character. And you can make some really strange combination of abilities since you can cherry pick from all the abilities of archetypes. That said, you can also make a monastic weapon specialist, a ki sorcerer/elementalist or an iron monk pretty easily. An idea I got after reading Henry's comments is something akin to bloodlines and cavalier orders, which depending on the "school" you get access to different powers, but with some free pickable ones also to represent individuality. This could also lead to different class skills, alignment restrictions and Ability Dependency, similar to how initiators have a different mental atribute that governs their... initiating? You may be right. But then I have a problem with the Cat's Tail insight. Bonus only on AoO are not very good unless you built specifically for AoO, and since it is based on dexterity, you would also built your character for dex, and then why not go all the way and forget about Cat's Tail? I think that, if Cat's Tail gave you half your dex bonus and was a prerequisite for Cat Turns Tiger, which in turn gave you full dex bonus to both insights it would make more sense. I get your intention I just feel the difference in value is too much, specially since it costs an insight. doesn't Ki Craft count only as craft weapons and armors? So weapons, armor and all wondrous items are fair game. How does Janni Rush interacts with Divine Wind? I would assume only on the first attack of the charge, but a comment from the author would be nice. Here is my first Unfettered Monk, at level 8th without buying stuff with point buy method at 20. BH means bonus from human, BM means bonus from monk, BI means bonus from insight, BF means bonus from feat and BT means bonus from traits. Feats: 1st Weapon Finesse, BH Agile Maneuvers, BM Improved Unarmed Strike, BM Stunning Fist, 3rd Weapon Focus; 4th BI Dodge, 5th Piranha Strike, 6th BI Mobility, 7th Improved Initiative, 8th BI Jabbing Style. Insights: 1st Cat’s Paw Strike,2nd Cat Turns Tiger, 4th Bend in the Wind, 6th Faster Movement, 8th Divine Wind, BT Style Training. So, without stuff, at level 8th I will be hitting at +11 (6 BAB, +4 Dex, +1 weapon focus), for 1d10+1, but flurry four attacks at +11 for 1d10+5. Add Piranha Strike at for +9 to hit 1d10+9, if 2 hits connect add 1d6, 3 for 2d6, and with the extra hit for ki it is even easier. And I haven't added dex gloves or amulets of mighty fists. One thing I would have liked is that piranha strike could meet some power attack prereqs., specially tiger style and jabbing style. After this I could go panther style to just run around the battlefield with ki to AC, provoking AoO and retaliating. Have to say this is the best Dex to damage monk by a long shot without having to multiclass swashbuckler or unchained rogue. Comments and/or suggestions more than welcome. That's a nice build on Jaiden Lee. There is one mistake with the flurry: at 8th level you only have three flurry attacks (1 attack at level, 2 at level 4, 3 at level 8, etc). I also think you're missing the two bonuses to stats from level 4 and 8 - so your Dex could/should be 20. Increasing both attack and damage by another +1. So, three attacks at +12 (1d10+6) at level 8 is pretty good. And two attacks at +12 (2d10+6 1d10+6) when doing a charge. All without items. w00t? I thought the column of flurry marked your extra attacks, but after reading closely you are right. I think 3 attacks, 4 with ki attack, is quite good anyway. Now I know why you upped the dmg at 2nd! I was going to increase wis to 16 at 4th but since 20th level is only a dream, i should increase dex at 4th and 8th and THEN wis to 16 at 12th. Aww excellent! I still remember my first pen-and-paper character for 3.5 - a barbarian called Lee Knux (it took my GM years to realize it was a play on Lynux). I never had opportunity to play 3.0 or the prior versions (other than what was implemented in Baldur's Gate). But I did play Das Schwarze Auge (a German RPG) years before that. It's great that you found a variant that works so well for you. See if you can get your GM/table warmed up to it as well. I have been thinking on starting a kind of blog where instead of writing a normal review, I would make some pc's/npc's with all the new stuff you can do with a book. That way, you can try a one-shot adventurs with an exotic pc or a foe with a mysterious npc. If I have the time, maybe even re-write stat blocks to make a existing adventure more interesting, specially if the players have already played it. I think I will start with the Unfettered Monk :-) aaaaand I promise I will stop clogging this thread. Darn, you're the one that is keeping the thread alive! Thanks for the shout out, Henri :) However, I did decommission tenletter a little while back and I haven't yet migrated all of the builds across to the new platform. That's because I'm planning to redo some of the character concepts as Unfettered and Unchained. Because I like tinkering. Ah, I guess I should've made that more obvious. I'm awaiting your build for One Punch Man. I have a few issues with this book, some good some bad. Before I review it, I have to state this book is in violations of the Pathfinder compatibility license. 1. No title page. It goes from "cover" straight to introduction page. 2. Missing items from Exhibit A the license agreement. 3. Doesn't state what is IP based on the OGL license. Technically without 2-4, this book isn't PF Compatible. 5. Semi Dead level at 9 (only 10 ft increase), and 13 which is completely dead. I will work on a review this weekend. You'll be happy to hear that the PDF has gone through Paizo (and various changes were made to the original submission over several passes between me and Paizo, some of which was with respect to the Pathfinder compatibility licence). They are happy with the final product and consider that it complies with the licence. I will of course immediately rectify any issues in this regard that Paizo may bring to my attention - but to my understanding everything is fine currently. Thank you Oliver Volland, your review raises a number of issues. I'll try to address a few of these below. Oh, and did I mention there are 152 chooseable insights available? You actually made me go back and count them all. I originally kept track of the number of insights (there were initially about 80 or 90), but over time I lost track with the numerous additions. As a side-note for anybody counting: Oliver Volland counted the various "Elemental" insights as 4 each, as each of those insights comes with an air, earth, fire and water option. Those are mutually exclusive, so Elemental Awakening (air) can be counted as distinct from Elemental Awakening (water) - even though they are presented within a single insight. the Ex-Monk section is contrary to the Beyond Order feat that is introduced later on which does allow non-lawful monks. I'd rule that the feat supercedes, but its not mentioned, and it would be interesting to know what would happen if the character took the feat later on. Will he be a full monk again? This is a case of a more specific rule trumping the general rule. A monk with Beyond Order cannot be an ex-monk, unless he exceeds the level limit given by Beyond Order. If a monk does become an ex-monk, he comes a non-ex-monk upon taking Beyond Order (provided he complies with the level limits of the feat). He immediately recovers the ability to take monk levels in this case. sometimes the 'Meditation Insight' is named as a requirement, but there are insights like Meditation of the Beast. Do they qualify? No, they don't. Only the meditation insight can be used to meet the requirements of insights that require the meditation insight. With Drunken Master the penalty is a poison effect. What is the synergy with Diamond Body? This is an intended interaction. The drunken master penalty can be fully negated with the diamond body insight. are reach melee attacks included in the damage of Elemental Awakening Fire? No. At least generally. As the text says: "adjacent creatures that strike the monk". So if they happen to strike the monk with a reach weapon while being adjacent to him, then they still take fire damage, otherwise not. Why is Elemental Mastery Water limited to enemies, but Fire isn't? Essentially a design whim. I like to think of the water element as controlled and mutable with circumstances; whereas the fire element is powerful, brazen and uncontrolled. Why does Faster Movement end with level 17? Wouldn't be +10 feet an acceptable choice? I would not say no to a player in this situation if I were the GM. That said, the design intention is to accelerate the benefit of fast movement and allow it to stack with other effects (by being an insight bonus it is possible for the monk to benefit, for example, from haste or/and boots of speed. Yes indeed. Kyton pact channels (hit point) damage into wounds. Does Monkey foot count against the movement of the current round or the next round like the feat Step Up does? The monkey foot insights grants you limited movement during a flurry. There is no hidden cost or penalty (other than getting the insight and using it as one of your deep insights). It has no impact on your next round. Asura Curse and Accurate Self should both be deep insights (they have the asterisk). Accurate self does say "This is a deep insight" - did you mean a different one? From a balance perspective improved wholeness of body is still slightly weaker than a paladin's lay on hands - while at the same time making use of a similar sized pool of uses and requiring the monk to spend two insights to acquire the ability. With, for example, 16 Wisdom/Charisma respectively a level 10 monk has a ki pool of 8/day and a level 10 paladin can use lay on hands 8/day. However, the monk also needs to use his ki pool to power all his other ki powers, whereas the paladin generally only spends lay on hands uses to lay on hands. Assuming both the monk and the paladin were to spent all their ki/lay-on-hands just for healing, then the paladin will (on average) heal 175 hit points, and the monk 100 hit points. Thanks for the clarifications. Accurate Self has been my fault, I wanted to compare the wording with Asura's Curse and mentioning the difference, but ended up misleading. Sorry for this. I enjoyed your work very much! Wow, I'm slow. Finally reviewed! Sorry for the delay, Henri! Review is up. You can see it and more over on my blog. 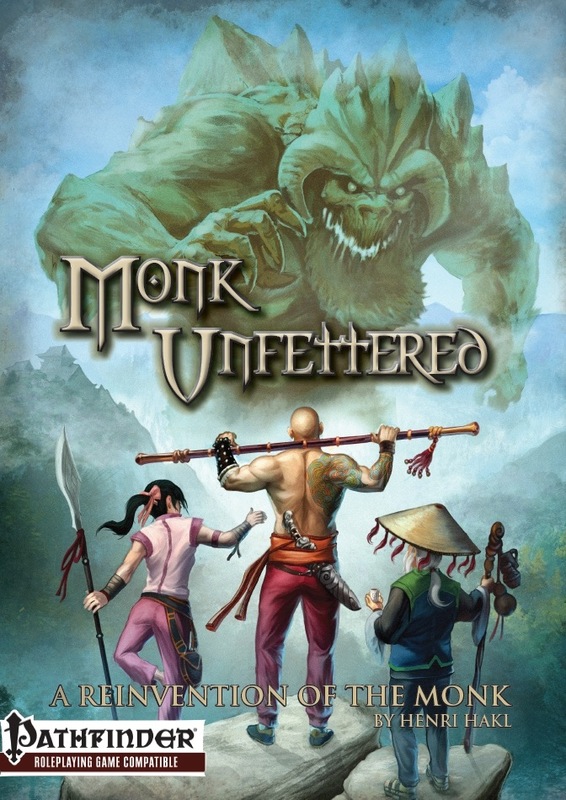 Thanks for taking the time to review Monk Unfettered. As you rightly point out, the sheer volume of insights of the unfettered monk can be quite overwhelming - so it can be easy to miss options and interactions (that is one of the reasons I've included an extensive insight reference at the end, so it is easier to see what insights are available, what is required for each insight, and what insights become potentially available by taking a particular insight. "On the down side, I think this is the worst monk at maneuvers I've seen." 1. One of the insights, "maneuver training" allows the monk to take any Improved maneuver feat without meeting the prerequisites (and the monk can take this insight multiple times); so access to any maneuver is assured. 2. The insight "aspect of the monkey" allows the monk to use his monk level instead of his BAB for maneuvers; so when you perform a maneuver (including during flurries) you effectively do as a full-BAB class. That also means that at level 20 you can do a flurry with maneuvers using +20/+20/+20/+20/+20/+20 (before other considerations). 3. The deep insight "maneuver flurry" essentially duplicates the Maneuver Master archetype; and allows you to perform any maneuver in addition to a flurry (including things such as grapples and dirty tricks). 4. The deep insight "embrace the cycle" allows you to always be considered flurrying; together with "maneuver flurry" that means that you can always perform a maneuver in your round - even when you do something like drink a potion, use the withdraw action, cast a spell with a 10-round casting time, and so forth. "But I feel like I've seen better in terms of solving the Monk's problems." I'm not sure which problems you specifically refer to, but the monk mobility-vs-flurry issues is extensively addressed. The unfettered monk also has excellent damage potential if built that way, likewise he has great versatility. "Also some abilities I stumble on because of a lack of rules language." Unfortunately I do not know what rules language you're missing, please elaborate - I do update the PDF and such clarifications can and will benefit all. "the Unchained Monk is more devastating due to it's access to Flying Kick"
On a mechanical level, you can consider the unchained monk's Style Strikes to be the equivalent of the unfettered monk's deep insights. Regarding Flying Kick - the deep insight "monkey foot" is better in all ways: more movement, you're not limited to where you move (no attack necessary), you're not limited to a "kick" attack, and the monk can take it earlier (though it isn't necessarily helpful until level 4, or when the monk has insights that grant him additional attacks such as "bane flurry" or "storm spirit"). This does not take into consideration other mobility-based solutions that the unfettered monk has access to. "This does depend on how Flurry interacts with Pummeling Style. If Pummeling Style works with Flurry then the Unfettered Monk has a little bit of a leg up but the margin isn't that wide." I think I'll make it explicit in the PDF, but "flurry" qualifies a monk for anything that requires "flurry of blows", so Pummeling Style naturally interacts with flurry. "but some moving sliding balance on some insights"
I assume you're talking about insights that grant more than one feat (such as "bend in the wind") as well as insights that grant special effects including duplicating feats (such as "typhoon dance" and "one touch"). The former are part of the balance of the class where the unfettered monk class loses 14 class features and gains only 11 insights in return. As such the insights are sometimes a bit stronger than an average feat; both to compensate for the extra removed class features and also to actually power-up the class (since the core monk being too weak is why monk replacements are made in the first place). The later (typhoon dance and one touch) are part of the deep insights and (like Style Strikes) are quite powerful and balanced by having limited utility on them. Any other products? I really enjoyed this one! Nothing yet - but I'm compiling various ideas. Maybe if I feel motivated something will happen next year?